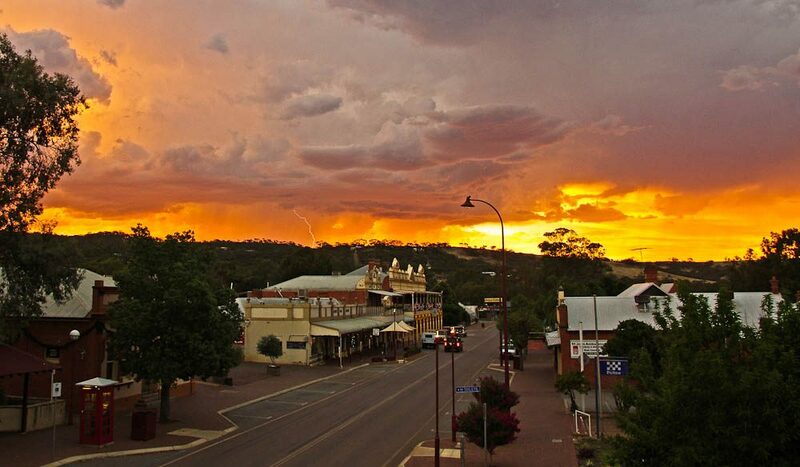 This image was taken of an approaching storm after sunset in the heritage town of Toodyay, 100 kilometres east of Perth in WA. It occurred during a heat wave a couple of days after Christmas. The sky was so colourful with lightning bolts erupting out of the clouds. I ran to the local hotel and raced up the stairs to the wooden balcony on the first floor to get a view of the main street in the foreground. Without a tripod, I rested the camera on the balcony railing and tried to guess when a lightning bolt would appear. I knew the scene and the light would not last very long. After about six shots I managed to get this one with lightning in the distance.